Green design concept with contemporary façade design to project Islam as a progressive religion. Central Courtyard to aid natural ventilation. Sculptural Minaret to be focal point of the mosque. Building positioning to compliment the future University Islam Malaysia Complex. Energy efficient and designed to maximize the use of natural ventilation. 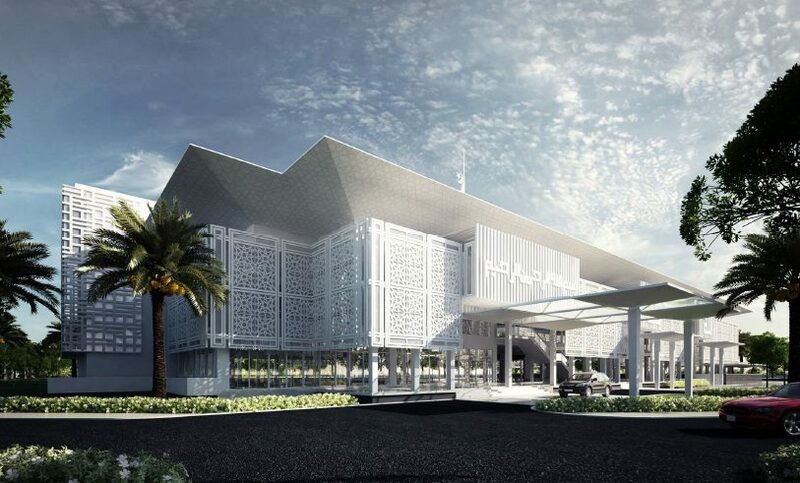 The main design approach was to make the mosque a truly sustainable mosque so that it will become a true model for the building of future mosques in Malaysia. The goal or original design intent of the mosque is to design the mosque’s main ‘Prayer Hall’ to be air conditioned for two hours during Friday prayers and during prayers for special events based on the Islamic Calendar. During other hours of the day and night, it is expected that the use of fans and ventilators would be sufficient. The Mosque is designed and planned to have an average daytime temperature of 26 degrees Celsius. Cyberjaya Mosque – Client The Government of Selangor / City of Cyberjaya – (Malaysia). Architect ATSA – (Kuala Lumpur). Green Building Consultants Terra Viridis – (Hyderabad).